Professional Freesat installation in Leeds – Dale Comm Leeds. Over 140 free digital channels and interactive services are available with FreeSat and if you have HD installed you can watch your favourite channels in glorious high definition which provides up to five times more enhanced picture quality, vibrant colours and dolby digital surround sound. Whether you need a new TV aerial, Sky Digital, Freeview or Freesat in the Leeds area. We can also wall mount your TV or install a bespoke commercial TV system for your business, and, we will do it professionally, efficiently and at a great price. Aerials Direct (London) has been helping customers like you for over 25 years. There is nothing we do not know about aerials and digital TV, so when you contact us, you can be sure you are getting qualified, experienced engineers. As well as keeping our prices as competitive as we can, we also offer a same day service to all residents in Leeds. When we have completed the installation, we will provide you with a two year labour guarantee, and for your peace of mind, we offer free, lifetime telephone support. Dale Communications in stall only the very latest Freesat systems, and will install the most appropriate box for your needs. We make Freesat Installation n Leeds a breeze. So, here are your Freesat installation choices? Freesat – gives you over 150 TV and radio channels including BBC3, BBC4, Film 4, ITV2, CBeebies, BBC News, Horror Channel, 5 USA and CNN. There are dozens of channels dedicated to entertainment, sport and music as well as loads of great kids channels. You can also access a wide range of digital radio stations including BBC 6 Music, 5 Live Sports Extra and XFM. Freesat HD – provides the same great range of channels, as well as offering many in high definition. 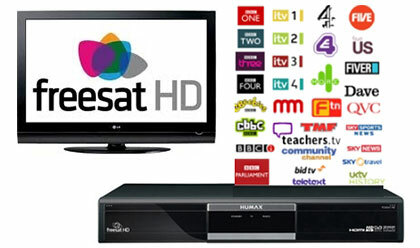 High definition channels include BBC HD, 4 HD and ITV1 HD. If you have an HD TV, this system lets you watch your favourite channels in sparkling high definition. Freesat Plus – you can pause, record and rewind live TV. You can store up to 300 hours of programmes when recorded in standard definition and up to 80 hours of HD television. You can press pause on a channel to make a cup of tea, rewind a channel to watch a scene again and record your favourite programme to watch it at a time convenient to you. Freesat Plus allows you to watch what you want, when you want.We offer a great range of Freesat boxes suitable for your viewing habits and your budget. Call us on FREE 0800 633 5311 to learn more.